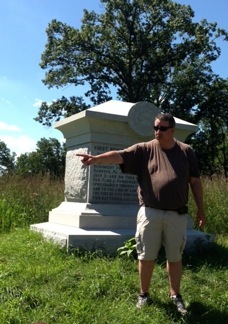 Eric Wittenberg discusses Farnsworth’s Charge in front of the monument. We continued the SB Author Conclave in the afternoon with Eric Wittenberg discussing General Farnsworth’s suicide cavalry charge ordered by General Kilpatrick on the afternoon of July 3 near Big Round Top in which they had no chance of success, and Farnsworth and many other troopers lost their lives. The First Regiment Vermont Cavalry fought Stuart’s Cavalry at Hanover, PA June 30 and at Hunterstown July 2. 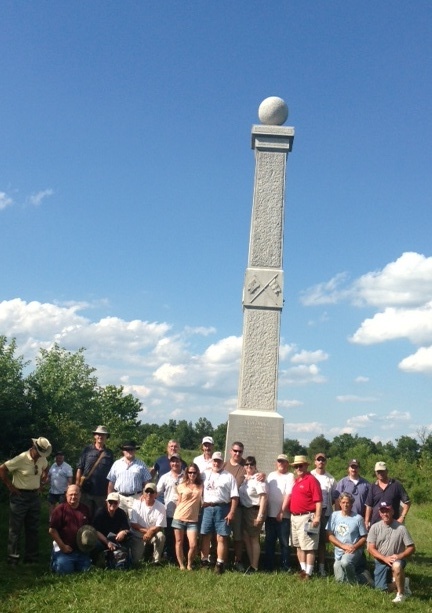 They met again on the field shown here on July 3, led by General Farnsworth who fell near this monument. They charged through the First Texas Infantry and to the line of Law’s Brigade, receiving the fire of five Confederate Regiments and two batteries, losing 67 men. Farnsworth led the charge because Kilpatrick questioned his honor. This is the only time that Eric Wittenberg knows of that a Union General was killed behind enemy lines leading an attack. Farnsworth was killed within 50 yards of the 1st Regt. Vermont Cavalry monument. Eric details the charge in Gettysburg’s Forgotten Cavalry Actions and answers some questions before we headed to East Cavalry Field. The Gettysburg portion of our trip wraps up tonight with an SB author dinner. Tomorrow our final day concludes with: South Mountain, Antietam, and Ball’s Bluff. The gang wraps up the day on East Cavalry Field. This entry was posted in Books & Authors, Upcoming Events and tagged cavalry, Eric Wittenberg, Farnsworth, George Custer, Gettysburg, Kilpatrick, Sarah Keeney, Savas Beatie, Savas Beatie Author Conclave. Bookmark the permalink.